I recently posted a picture of the compost tumbler that I "inherited" from my FIL but here is my baby again. I am thrilled to have it, I have wanted one forever but I was just a bit hesitant to get one. My main objection is the cost. My tumbler came from here. There are many types like this on the market and none of them are cheap. Is it worth the cost? You can pile up garden waste in the corner of the yard and do nothing to it and eventually you will have compost. If you are willing to wait a few years. Can the tumbler make compost in 8 weeks or so as the literature claims? I'm going to track it and see how long it takes. I'm going to post brief updates from time to time to let you know how it goes. I started a batch on Sunday. The instructions say put in a mix of green to brown ingredients about a 50/50 ratio not to exceed a 75/25 ratio. My mix is about 60/40 of green to brown. MrPeachez mowed the grass so almost all my green is grass clippings with a few kitchen scraps thrown in like artichoke leaves and watermelon rind. To that I added a bunch of dead plant clippings that have all turned brown, some old, old coco liners, some old potting soil from last years pots and a bunch of paper from my shredder. I've been spinning away and the mix is looking pretty good. The bin is full now, but by the end the volume will decrease by 50%. I'll keep you posted. 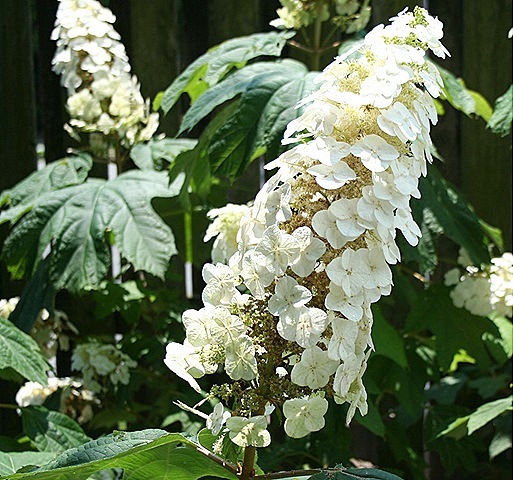 Now, after looking at garden garbage I'm going to put up a few pretties from the garden. Oh I’m very excited for you and your compost adventure! I get a wheel barrel full of compost from my neighbor every year around this time and I use it as if it’s GOLD! I would love to have a composter like yours to make the turning easy. How excited you must be to periodically check on it! Great to recycle and end up with GOLD! Thanks for stopping by to see my pool side garden. I used some of my GOLD from my neighbor! 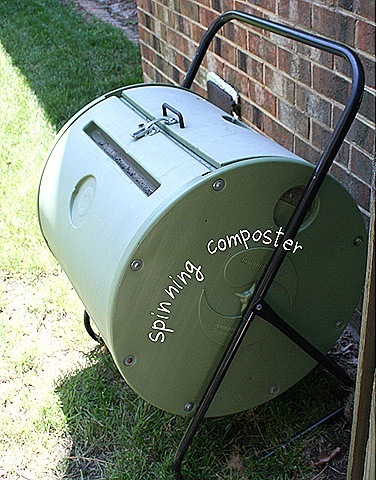 I have a composter but I think yours is much better because you can tumble it! Isn’t it funny how we can get so excited about a composter? 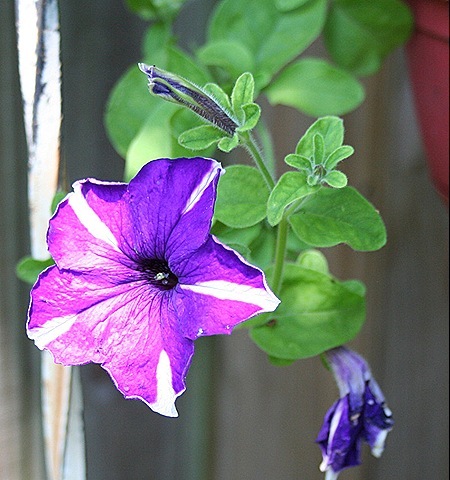 Your flower pictures are beautiful! 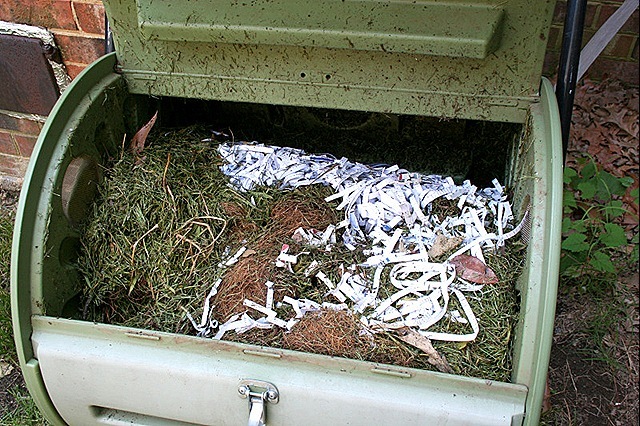 Oh…I am so JEALOUS…a tumbling composter…sigh. Heaven. I’ve wanted one forever. I am so looking forward to hearing all about the lovely compost you’ll be making! Your flowers are beautiful and I do SO think it will be worth it! I think it’s GREAT! Lovely photos, Suzy. And I too just love Gardener’s Supply Company! I’m growing hollyhocks for the first time — I planted them last year and they’ve come back early and strong! This looks like a great composter. I went to your Gardener’s Supply link and drooled. We have an old Smith & Hawkin’s that’s Ok but this one looks much easier to move and turn. I will look forward to hearing what you think and how well it works. Keep us composted! can you keep adding to it as you go or once you fill it you have to wait for it to turn into compost? 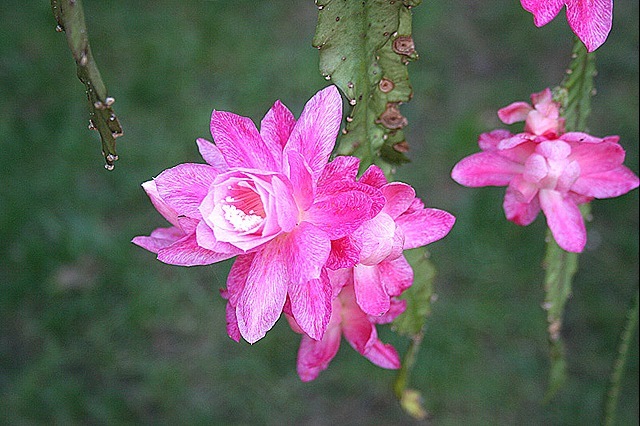 Your photos of blossoms in your garden are exquisite! Great composter. I’m not familiar with that spinning kind but I bet it will work beautifully. We had an old plastic one (the stationary kind) for years and it was a lot of work turning its contents over by hand with that special pointy tool. Too hard for me; I left it up to my husband to do. After years of use, our bin fell apart. We may have to look into the spinning kind once I get your seal of approval! Gracious – your composter looks like a very neat and easy to use one – I have thought about one, but due to limited space never bought one. Yours looks very nice and compact and like it really works. I can’t wait to see your compost in 8 weeks. 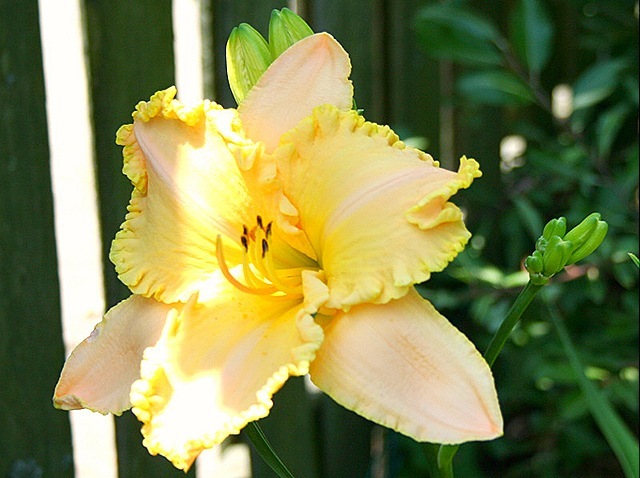 Your garden photos are beautiful. Keep us updated ‘As The Composter Turns…’ – no seriously, I have been thinking about getting one, or having one made, but was skeptical that it would REALLY be that much better than the ‘pile out back’ – THANKS in advance!! Like you one of those has always been on my wish list,keep us up to date! Gosh, I hope you can get that thing to produce compost in a timely manner! My husband bought the exact same one for me a couple of years ago and I have to say, things have not gone as planned. Of course, I didn’t spin it daily (but I did spin it 3-4 times per week), and I am sure I didn’t get the proportion of green/brown right. I just throw whatever in there whenever I have it (kitchen veggie scraps, dead flowers, old potting mix, staw, leaves, etc.) I am hoping that you can show me that it does work indeed! We all wait to see the results of your experiment! oh how wonderful! I just love all your plants…beautiful! 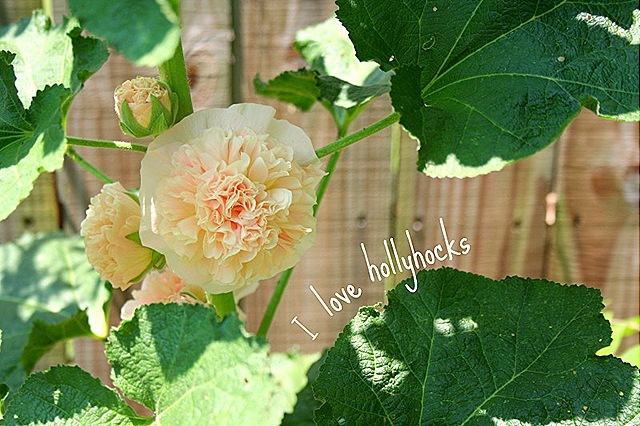 I planted Hollyhocks from seed and they are still really small….don’t know if they will ever bloom!